(SANILAC TOWNSHIP) – On February 21, 2019 at approx. 07:08 A.M. Sanilac Central Dispatch received a call from Carsonville-Port Sanilac Schools advising that one of their school buses had tipped over in a ditch with students on board. Upon the first initial call it was unknown if there were any injuries to any of the occupants. Port Sanilac Fire and Rescue were first on scene and advised that there were no reported injuries to either the students or the driver of the school bus. According to Deputy Chad Adams, Deputies arrived on scene and determined that the school bus had not tipped over but in fact had slide into the south side ditch of Goldman Avenue just east of S. Lakeshore Road in Sanilac County’s Sanilac Township. 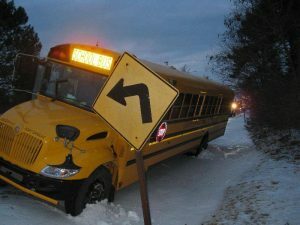 The driver of the school bus along with the 10 children on board were traveling west on Goldman Avenue when the bus began to slide backwards down the hill causing the school bus to slide into the ditch. There were no reported injuries or damage to the school bus. Sanilac EMS responded to the scene to check on the occupants. Deputies were assisted on scene by Michigan State Police and Port Sanilac Fire/ Rescue.